When I was studying at the Los Angeles Music Academy (today: LACM) at the turn of this century, Joe Porcaro (JoPo) was my teacher for jazz drums, along with Tony Insalaco and Sherman Ferguson. Even back then he could have enjoyed his pension, but he didn’t, and he still doesn’t. Joe still loves to spread his passion among youngsters from all over the world. Mainly he does so by teaching classes at the Los Angeles College of Music in Pasadena. Together with Ralph Humphrey he is the drum department chair – together they wrote the curriculum as well. JoPo always took his vocation very seriously. I remember one day, when he run out of class in a rage, because none of us had practiced his assignments from the week before. You can bet that was the last time, we didn’t. In this video Joe gives away the most important lesson for drummers who want to become a pro. When I went by my old school after the NAMM Show this year, I was surprised to hear that JoPo is still teaching. Ralph Humphrey suggested to call him up and also schedule an interview with him. So I did and the next day Joe skipped his lunch between classes and talked to me about whatever came into his mind. He also answered all of my questions of course. How great to see him again. Yet another outstanding drummer with a long career in the music business. As many of the great ones, Joe Porcaro never had a plan B. 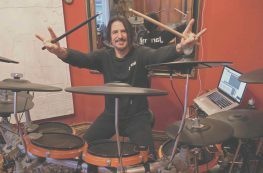 Nonetheless the self-taught drummer worked several jobs until he was able to make a living as a musician. JoPo started out on the East Coast and later in the 1960s followed his dear friend and percussion legend Emil Richards to the West Coast. Together with his wife Eileen he became parent to three boys and one daughter. All of the boys were part of the band Toto: Jeff, Mike and Steve Porcaro. And Joe guest-starred in almost every one of their records. Guess, what he played in “Africa”!? In this video Joe talks about his kids when they were still young and learning about music. He remembers the Grammys in 1983 as one of the greatest moments in his life. And he also talks about Jeff – his talent, commitment, groove and drawing skills. Nowadays his grandchildren carry on the musical torch of the family: Paige and Chase Duddy for example are the sister and brother duo XYLØ.